1 Cover broccoli florets with water in medium saucepot and bring to a boil over high heat. Reduce heat to low and simmer until broccoli is crisp-tender, about 5 minutes. Drain and rinse with cold water until completely cool; set aside. 2 Cook bacon in medium skillet until just starting to brown. Add onion and cook, stirring occasionally, until bacon is crisp and onion is tender, about 5 minutes. 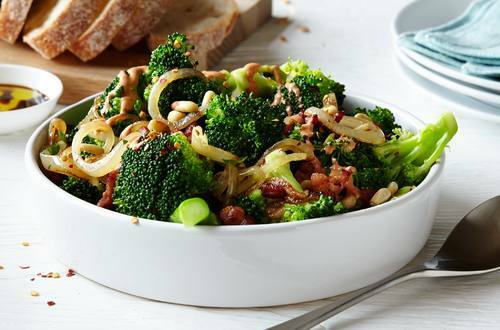 3 Combine cooked broccoli, onion mixture, pine nuts, parsley and hot pepper flakes in large bowl; set aside. 4 Combine Hellmann's® or Best Foods® Real Mayonnaise, vinegar and paprika in small measuring cup or bowl. Pour over broccoli mixture and toss well.